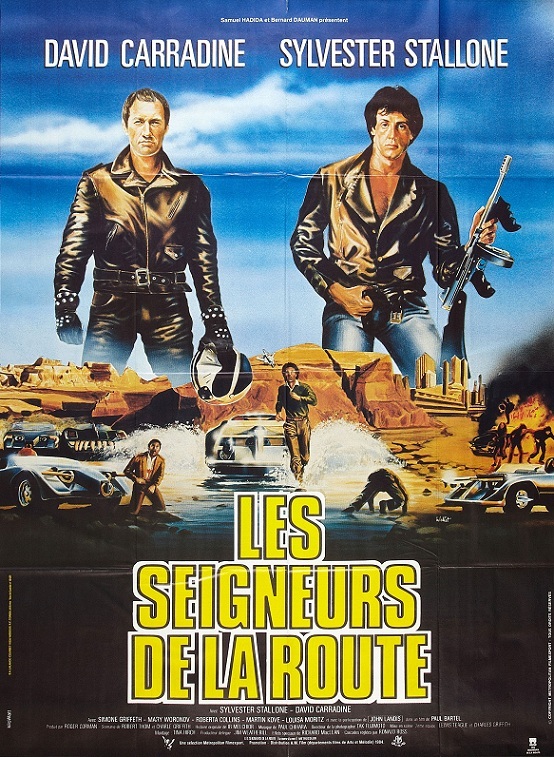 Digi-Schlock: DEATH RACE 2000 (Shout! Factory DVD) – Schlockmania! Death Race 2000 has been made available on home video several times since the 1980’s but has never really gotten the treatment a cult flick of its stature deserves. From its VHS debut to the early DVD era, it was limited to washed-out open-matte transfers that dulled its pop-art visual appeal. A widescreen disc put out by Disney in 2005 offered a visual upgrade and a few decent extras but didn’t quite deliver the powerhouse treatment such an iconic exploitation flick deserves. It also went out of print fairly quickly. Thankfully, the new special edition disc from Shout! 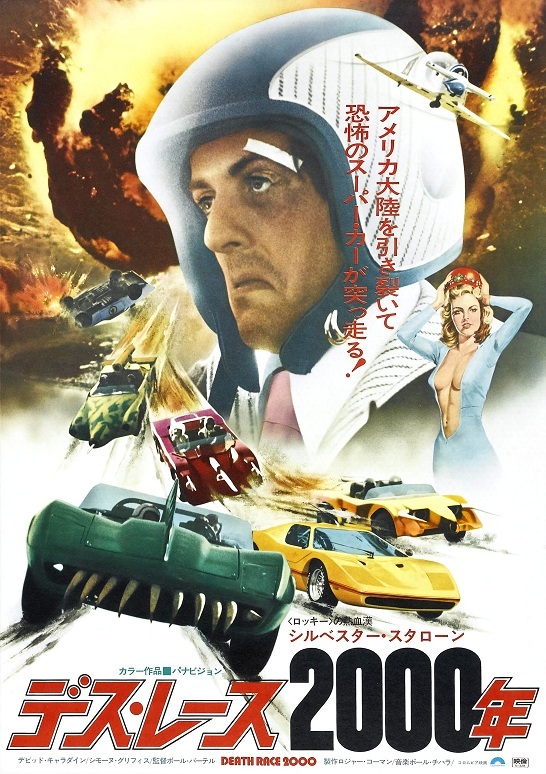 Factory, issued as part of its Roger Corman Cult Classics line, gives Death Race 2000 the five-star treatment it demands. It boasts a new anamorphic widescreen transfer that was taken from the interpositive film elements and the result is the best this film has ever looked on video. The colors pop and the visuals are sharp. For the audio, they’ve retained the original mono soundtrack instead of any remixing. It’s a solid track with plenty of oomph. Better yet, Shout Factory’s Death Race 2000 disc adds a generous array of supplements to further boost the value of its excellent transfer. The extras begin with not one but two commentary tracks: the first features editor Tina Hirsch and assistant director Lewis Teague while the second offers producer Corman and star Mary Woronov. The Hirsch/Teague track was recorded for this special edition and is a technical-minded affair, with each participant delving into the specifics of their work on the film and delivering some juicy behind-the-scenes info (Hirsch has some really interesting stories to tell about the film’s last-minute mixing sessions). The Corman/Woronov track is carried over from the Disney disc and is a broader affair, with Corman covering all sorts of production info while Woronov reflects on working with her fellow actors. It’s probably the more entertaining of the two but both are worthwhile listens for fans. However, the heart of the supplements category is a set of six featurettes that add a substantial amount of additional info about the making of the film. All but two were produced especially for this new edition. Topics covered include production design, the musical score, the costumes as well as more general info. Your Humble Reviewer’s favorites were Ready To Wear, an interview with costume designer Jane Ruhm, and Start Your Engines, an interview with Ib Melchior, whose story inspired the film. Ruhm tells some eye-opening stories about the challenges of working with David Carradine and Melchior reveals the real-life tragedy that inspired the concept. Collectors will want to note that the 10-minute making-of piece from the Disney DVD and the Leonard Maltin interview with Corman from the old New Concorde disc of this title are included here. All of the new featurettes were edited by Michael Felsher and he does the expected skillful job with them. The interviews have been crafted into engaging narratives, with well-chosen footage acting as counterpoint and music sometimes used to ironic effect. The featurettes also boast some snazzy, retro-styled titles sequences. David Carradine passed away before he could be involved this disc but he appears via a clip from an interview for a different film where he talks a bit about Death Race 2000. It’s short but sweet, with Carradine laying out the broad st rokes of the experience in a laconic and witty manner. The extras are rounded out by two versions of the theatrical trailer (one featuring commentary from John Landis, who also cameos in the film), a t.v. spot, radio spots and trailers for other Corman titles being released by Shout! Factory. The final touch is a nice full-color booklet insert with an essay on the film and tributes to stars Roberta Collins and Simone Griffeth. There’s even a reversible cover that features the film’s Japanese poster art on the flip side. All in all, this special edition offers a definitive treatment of Death Race 2000 on disc. It’s a shame that Carradine and Paul Bartel died before they could see it but everything here, from the transfer to the supplements, is a sterling tribute to their work (and that of everyone else involved in the film). Needless to say, the disc is a required purchase for fans and well worth the cheap admission price for anyone interested in classic exploitation filmmaking.